Here are the photos of four of my slings. Below is some explanatory text (short version). Photo 4sling01.jpg shows my recent design with ears to protect the strings. The strings are a round 4 plait, lanyard style using #18 seine twine (mason’s line). If someone is interested, I can send info on how to do the strings. The pouch is 2” across and about 6 ¼” inside the ears. The string is plaited from the retention loop (4slings02.jpg) first down to the length you want minus half the pouch (this keeps is off the ground.) Then pass two strands thru each side of the pouch. The holes are just big enough to take the strings tightly. 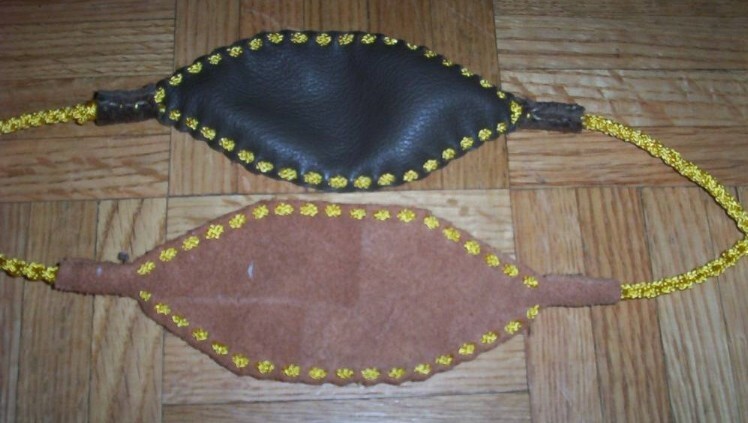 But since the leather stretches a bit, I use a small sewing fid with one strand at a time. This goes very quickly using the fid and the leather closes back up quickly as well. Once the strands are thru the pouch, I continue to plait until the release end is about six inches longer than the retention end. I then whip it off and tie a release node as desired (4slings03.jpg). 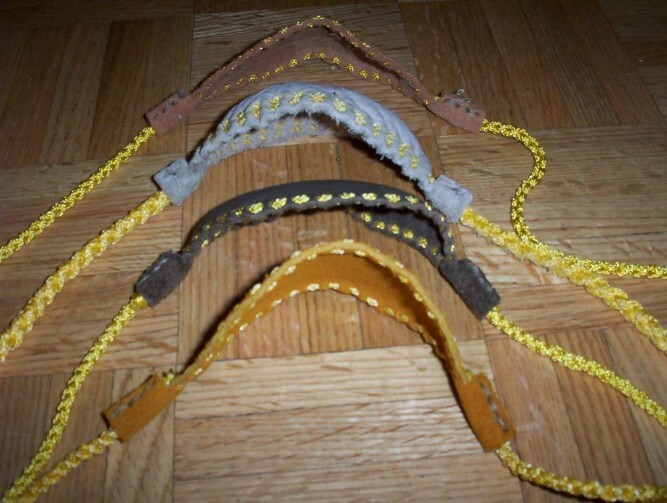 Then I sew up the ears on the pouch and there you have it (4slings04.jpg and 4slings06.jpg). This all takes several hours to complete from beginning to end, but makes a nice sling. I use leather for the pouch. Any leather that is soft enough to stretch a bit and hold the projectile will do. I use AutoCAD to draw the pouches. I print them on drafting appliqué film which I stick onto the leather. The pattern has the outline as well as the holes. This helps cut it out and punch the holes. If anyone is interested in the pattern, I could print some out and mail them with some instructions. (I will have to think about whether I could do this for free.) Additionally, I could potentially draw other patterns for people and print them on appliqué film. Pretty nifty design. I like how the material is folded over at the ends to surround the cord. Stitching it through the pouch looks cool and adds reinforcement. Are those hand-braided cords, or did you just buy pre-braided? Very nice looking slings! 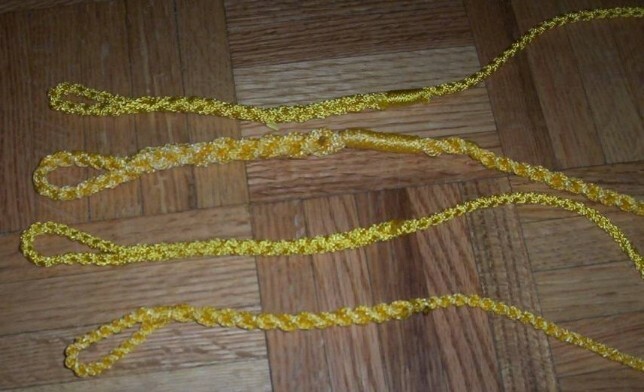 They look similar to the ones I made from the "20 Steps to a Sling" The protective ears on the ends is a good idea. I had to run a bead of hot glue over the edges to keep the sharp concrete from cutting the cords stitched thru the edges. I need to get my son to show me how to post pictures of my slings. I hand plaited them myself. It is round 4 plait, boyscout lanyard style. I learned the plait to make the sling. It is pretty simple. As I wrote above, I can send instructions on how to do the entire thing. I found the instructions on the web, but don't remember where. I modified the pouch, but otherwise it is a borrowed idea. You have to plait your own in this design to make the strands go thru the pouch. This design could easily be modified to use cords of other type so that the cord sewed into a modified ear section. 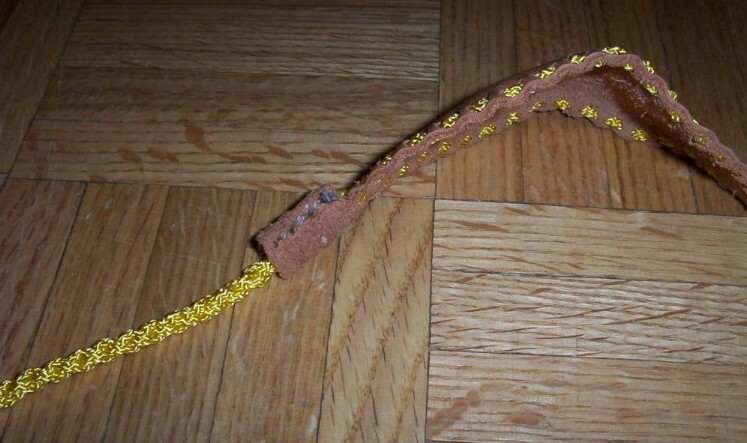 The cord could be plaited leather or thong. In this scenario, tho, the pouch would have no reinforcing along the edges. I believe that "20 Steps" is where I got my instructions. Could not remember before. Tieing the knots at the ends of the pouch was way to difficult to get even, and left the string very exposed. Hence the extended ends and ears. Otherwise the sling is pretty much per the instructions. The slings are lookin' good! I really like the way you wove the cords through the edge of the pouch. Out of the four pouch shapes you posted above, do you have a favorite? Maybe one that seems to hold a stone better than the others perhaps? In the first pic, from the top, numbers 1, 3 & 4 are exactly the same design. 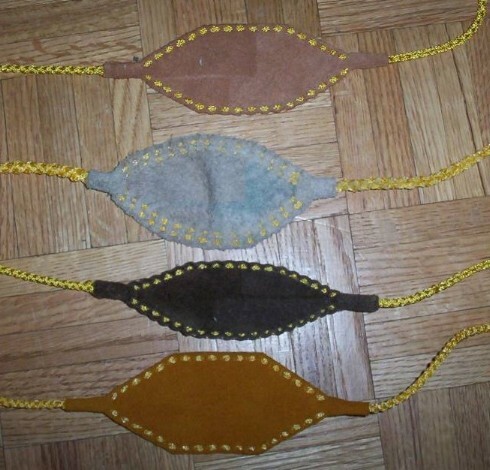 Stringing the pouches in combination with different stiffnesses of the leather used causes some slight variations in the shape. Pouch #2 is the same except I made it a bit larger to take two rows of string on each side. I did this because I used 8 strands instead of 4 for the cord. Otherwise, these are all the same design and construction. I don't really have a favorite yet because I don't get to use them enough to tell. However, I do find the 8 string cords to be easier to handle in general. I have thrown some very large stones a long way with #2. IMHO David is right, if you want to make the hard ball-firing with stones, the edge cords should be impregnated inside of the pouch. It would be pity to waste your effort. I like the design and I've been itching to learn how to braid such slings. It would be great if you could send me the instructions. If you can put together a substantive write-up, i'll post it in the articles section. I am working on the text as you read this. 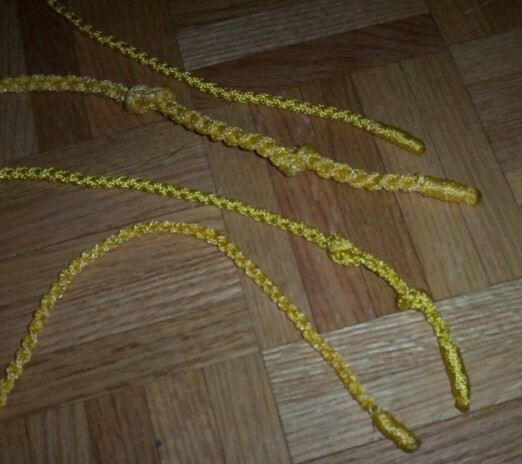 I will make a sling and get some pics to add to the article. It was by far the easiest one to follow. I just tried that goggle search and never found the site.